During the early development and throughout the short history of green/conservation criminology, limited attention has been directed toward quantitative analyses of relevant environmental crime, law and justice concerns. While recognizing the importance of establishing a theory and terminology in the early stages of development, this book redresses this imbalance. 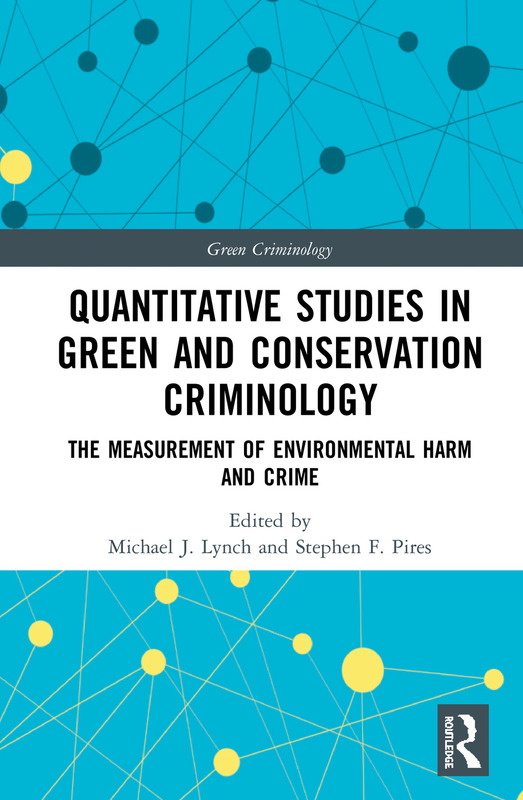 The work features contributions that undertake empirical quantitative studies of green/conservation crime and justice issues by both conservation and green criminologists. The collection highlights the shared concerns of these groups within important forms of ecological crime and victimization, and illustrates the ways in which these approaches can be undertaken quantitatively. It includes quantitative conservation/green criminological studies that represent the work of both well-established scholars in these fields, along with studies by scholars whose works are less well-known and who are also contributing to shaping this area of research. The book presents a valuable contribution to the areas of Green and Conservation Criminology. It will appeal to academics and students working in these areas. Foreword: Quantitative Studies in Green and Conservation Criminology, Ronald V. Clarke; Chapter 1: Why Quantitative Studies Matter in Green and Conservation Criminology. Michael J. Lynch and Stephen F. Pires. ; Chapter 2: The Branches of Green Criminology: A Bibliometric Citation Analysis 2000 – 2017. Ryan Thomson, Tameka Samuels-Jones, and Liam Downs. ; Chapter 3: Quantitative Studies in Green and Conservation Criminology: A Literature Review. Michael J. Lynch, Paul B. Stretesky, Michael A. Long and Kimberly L. Barrett. ; Chapter 4: An Agenda for Criminological Investigation of Crimes Impacting Primates. Lauren Wilson and Justin Kurland. ; Chapter 5: Structural and geographic features of illegal urban bushmeat trafficking. Jessica Kahler, Rachel Boratto, Liliana Vanegas, Michelle Wieland, and Meredith Gore; Chapter 6: Human-Wildlife Competition: The Role of Human Activities, Environmental Transformation, and Water Scarcity in Explaining Mammalian Species Loss. Kwan-Lamar Blount-Hill and Mangai Natarajan. ; Chapter 7: Comparing and Contrasting Wildlife Seizures made at EU and US Entry Points. Daan P. V. Uhm, Stephen F. Pires, Monique Sosnowski, and Gohar Petrossian. ; Chapter 8: Examining Factors Predicting the use of Wildlife Killing by the US Fish and Wildlife Service Across States. Leo Genco. ; Chapter 9: The Ten-Year (1999-2008) Trend in Hazardous Waste Violations and Punishments in the United State From US EPA Resource Conservation Recovery Act Data. Michael J. Lynch. ; Chapter 10: Waste Crimes in Italy: An Empirical Exploration of their Geographic Distribution. Daniela Andreatta. ; Chapter 11: Longitudinal Methods for Analyzing Green Crime. Michael A. Long, Paul B. Stretesky, and Kimberly L. Barrett. ; Chapter 12: No Longer Victorian Children: Understanding Green Victimization through an Analysis of Victim Impact Statements. Joshua Ozymy and Melissa Jarrell. Michael J. Lynch is a professor in the department of criminology, University of South Florida. He has examined green crime, law and justice issues for over thirty years, and published the first discussion of green criminology. His recent publications have appeared in Capitalism, Nature, Socialism; Ecological Economics; Global Ecology and Conservation; Society and Natural Resources; Journal of Quantitative Criminology; Theoretical Criminology; Deviant Behavior; and Sociological Spectrum, among others. He is recipient of Lifetime Achievement Awards from the American Society of Criminology Division on Critical Criminology & Social Justice, and the Division on White Collar and Corporate Crime. Stephen Pires, PhD, is an associate professor in the Department of Criminology and Criminal Justice at Florida International University. He is an expert on the illegal wildlife trade with a particular focus on commonly-poached species (i.e. hot products), illicit markets, & the organization of the illegal trade. His work has appeared in the Journal of Research in Crime & Delinquency, The British Journal of Criminology, Bird Conservational International, and Forest Policy & Economics, and has co-authored the book, "Wildlife Crime: An Environmental Criminology and Crime Science Perspective" (2018). Now two decades old, green criminology - the study of environmental harm, crime, law, regulation, victimization, and justice - has increasing relevance to contemporary problems at local, national, and international levels. This series comes at a time when societies and governments worldwide seek new ways to alleviate and deal with the consequences of various environmental harms as they relate to humans, non-human animals, plant species, and the ecosystem and its components. Green criminology offers a unique theoretical perspective on how human behavior causes and exacerbates environmental conditions that threaten the planet's viability. Volumes in the series will consider such topics and controversies as corporate environmental crime, the complicity of international financial institutions, state-sponsored environmental destruction, and the role of non-governmental organizations in addressing environmental harms. Titles will also examine the intersections between green criminology and other branches of criminology and other areas of law, such as human rights and national security. The series will be international in scope, investigating environmental crime in specific countries as well as comparatively and globally. In sum, by bringing together a diverse body of research on all aspects of this subject, the series will make a significant contribution to our understanding of the dynamics between the natural world and the quite imperfect human world, and will set the stage for the future study in this growing area of concern.